Fortunately it’s West Virginia and the mall was not a gun-free zone. 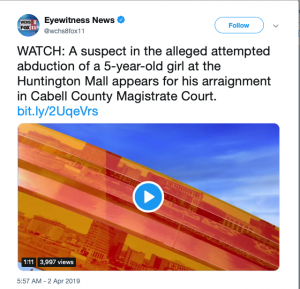 BARBOURSVILLE, W.Va. (WCHS/WVAH) – A man from Egypt was taken into custody after he was accused of attempting to abduct a 5-year-old girl at the Huntington Mall, and police said the child’s mother pulled a gun and told him to let her go. An interpreter was present for Zayan’s arraignment as he spoke Arabic and did not speak English. Police said Zayan is an engineer who was in the area for work and has been living in a local motel.